According to a new market report published by Transparency Market Research, the global workforce analytics market is expected to reach a value of US$ 2,453.9 Mn by 2026, supported by rising adoption of compliance initiatives, improved operational efficiency, and controlled workflow. The market is projected to expand at a CAGR of 10.3% during the forecast period from 2018 to 2026. Increasing demand for integrated workforce analytics, growing trend of mobile workforce coupled with multiple benefits offered by workforce analytics are encouraging the higher adoption of workforce analytics. In addition, rising penetration of mobile devices is boosting the global demand for mobile based workforce analytics. Asia Pacific is anticipated to be the fastest growing region for the market during the forecast period which is expected to be followed by Europe. Workforce analytics is experiencing flourishing growth in terms of adoption across different industry verticals around the globe. Increase in the implementation of big data analytics and artificial intelligence offered by vendors is further contributing to the growth of the workforce analytics market. The growth of workforce analytics software/services is directly or indirectly related to the growth of workforce management solutions, as most of the vendors offer workforce analytics solutions as an add-on feature to their workforce management solutions. Adoption of workforce analytics by small and medium-sized enterprises (SMEs) is increasing mainly due to cost efficiency as well as limited capital investment required for subscription based (cloud) services. Installing workforce analytics in an organization for cost cutting and time savings (process optimization) is fuelling the growth of the market substantially with the trend expected to be maintained during the forecast period. The workforce analytics market has been segmented on the basis of parameters such as component, enterprise size, application, end-use industry, and geographical regions. In terms of component, the market has been segmented into software and services. The software segment has further been segmented into cloud, on-premise, and hybrid while the services segment has been classified into managed and professional services. The enterprise size segment includes small & medium enterprises (SME’s) and large enterprises. While considering the application based segmentation, the market has been divided into time & attendance, scheduling & staffing, performance management, benchmarking and others (recruiting management, turnover tracking etc.). In terms of end-user industry, the market has been segmented into BFSI, telecom & IT, government & public sector, healthcare, retail, energy & utilities, manufacturing, and others (aerospace & defense, travel & hospitality). 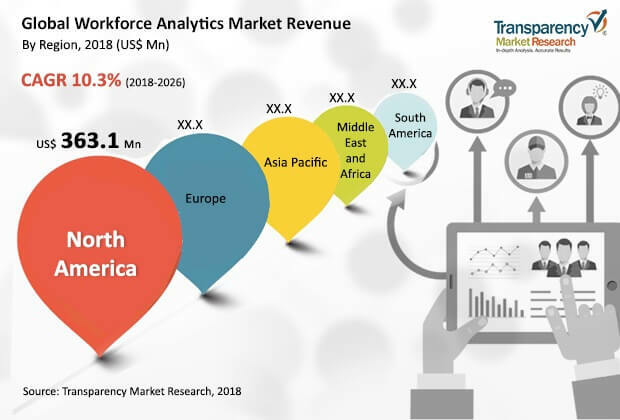 The report covers the analysis of these segments across North America, Europe, Asia Pacific, Middle East & Africa, and South America, along with the qualitative analysis for market estimates supplementing the growth of the workforce analytics market during the forecast period. BFSI, and telecom & IT segments are anticipated to experience lucrative growth opportunities in the market. In terms of adoption of workforce analytics, the BFSI sector is projected to expand at a CAGR of approximately 12.0% during the forecast period from 2018 to 2026. North America and Europe collectively accounted for more than 50% of the global market share in 2017, with North America holding larger share of the market. Technological developments and relatively higher maturity in terms of technology penetration are major drivers of the workforce analytics market in North America. Within the Europe workforce analytics market, Germany held the largest revenue share in 2017, closely followed by the U.K. Asia Pacific, which includes China, India, Japan, and Rest of Asia Pacific, is expected to witness the fastest growth during the forecast period attributed to the rapid technological developments in various industry verticals across different countries. Moreover, several emerging economies in the region experiencing growth in their infrastructure which covers the government sector, IT sector, law firms, chemical industry, and others is further supporting the workforce analytics market growth in this region. The research study includes profiles of leading companies operating in the global workforce analytics market. Some of the key players profiled in the report include ADP, LLC, Beeline, Cornerstone OnDemand, Inc., GainInsights Solutions Pvt. Ltd., Genpact Ltd., Kronos, Inc., Nakisa, Inc., Oracle Corporation, PeopleFluent, PeopleStreme Pty. Ltd., SAP Success Factors, Tableau Software Inc., TALENTSOFT, Visier, Inc., Workday, Inc., and WorkForce Software LLC.